carolan, director of bikram yoga in dupont, put together a lovely non-profit service to our community by offering free yoga at meridan hill/malcom x park on sundays in june. details here. despite the insane temperatures and the fact that it was father's day, we had an amazing turn out last sunday in the park. 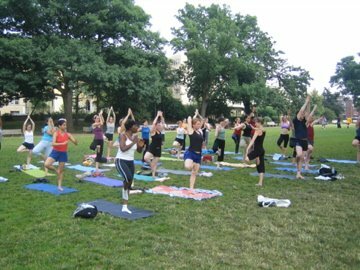 as i headed up there to teach i wasn't feeling very well, but when i saw the yogis and got into the groove, the not-so-fabulous belly subsided. 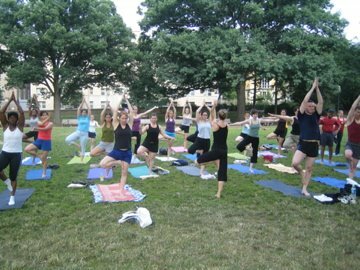 kudos to carolan for creating such a special offering to our fabulous yoga-loving and yoga-curious washingtonians. i hope you enjoy the attached photos that she took while i taught. please join tranquil space for our upcoming potluck picnic in the park (at 23rd and p, down the hill into the park before the bridge) on sunday, july 23 from 6-8pm. 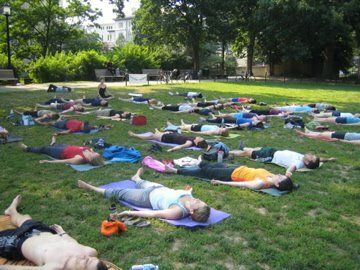 i'll lead a mini 45-minute to 1-hour yoga class and, i promise, nothing beats doing yoga in the great outdoors! bring your mat, a treat to share, friends, family, canine companions, and a desire to meet some amazing yogis! i can't find information on which park on the events list or the link to the online signup forum thing. do you mind posting it?